After the rally, I was asked by someone pretty high up in state government if indexing was a line in the sand for the coalition. The person asked, “Can we take a victory and live to fight another day?” This is actually a really good question. I am one who often argues that, when it comes to politics, let’s not let the perfect be the enemy of the good. 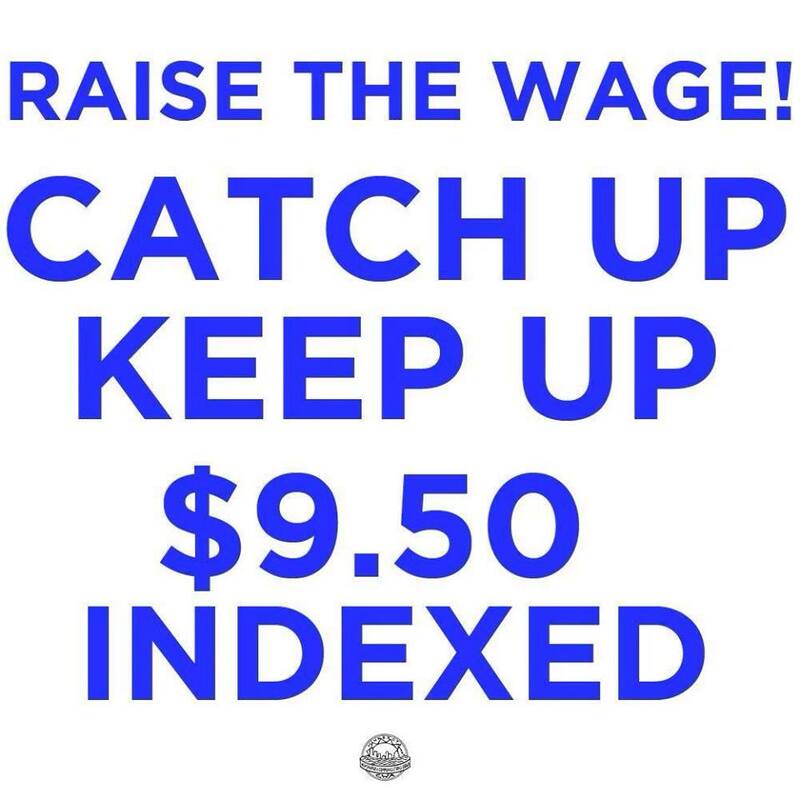 So why is the fight for indexing so important that the Raise the Wage Coalition has kept the charge going? To answer this, it would be helpful to remind ourselves what it is we talk about when we talk about the minimum wage. No one can dispute that, even if we raise the wage to $9.50, that does not get a full-time worker supporting a family out of poverty according to the federal government’s own definition of poverty. What we are arguing about, friends, is a floor. Now think about the effort that has been put together to convince a DFL legislature to pass a bill. Last year the Senate passed a bill for with a $7.75 an hour wage, which would have put us barely past conforming with the federal minimum wage (right now, Minnesota’s minimum wage is significantly lower than the federal minimum wage). 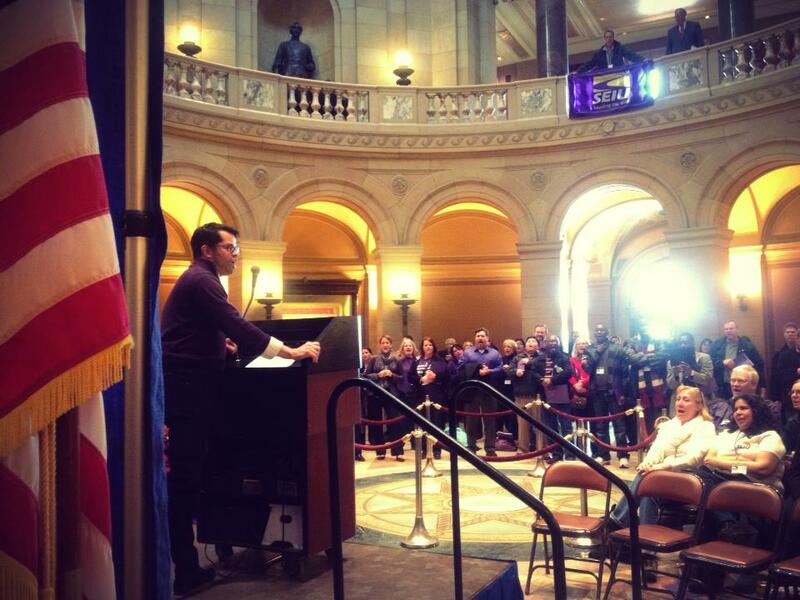 To get them to move to $9.50 Minnesotans across the state mobilized to make their voices heard. Oh, and the president and governor of the same party as the Senate’s majority set the bar even higher than $9.50. Some of the best organizing and policy minds in the state are intensely focused right now on passing this minimum wage bill. The Raise the Wage Coalition has been impressively co-chaired by Shar Knutson of the AFL-CIO, Peggy Flanagan of the Minnesota Children’s Defense Fund (CDF), and Brian Rusche of the Joint Religious Legislative Coalition (JRLC). The people moving phone banks, working at the Capitol and on weekends in districts, generating emails and calls to legislators — these are leaders of some of the most important social justice organizations in the state — non-profits like CDF, the Wilder Foundation, and many more; clergy and faith groups like the JRLC, which unites Catholic, Protestant, Jewish and Muslim entities, as well as ISAIAH’s coalition of over 100 churches; community organizations like Neighborhoods Organizing for Change, Take Action Minnesta and many more; unions like Education Minnesota, AFSCME, SEIU, the AFL-CIO’S state and regional federations, and many more. The best organizers of the social justice movement in Minnesota are working tirelessly for this minimum wage increase, as we must. It is an impressive operation, but we cannot forget what it is we talk about the minimum wage. The best minds of the social justice movement in Minnesota are immersed in a debate about the floor. Our best organizers, leaders and policy thinkers are debating essentially how poor we as a society are willing to let workers live. This is not the visionary work a movement for social justice. Again, this work is essential and we should all be proud of the collective effort, but let’s not kid ourselves about what we are doing here. The heavy lift everyone is undertaking is to debate a freaking floor. A Minimum. Can you imagine if all of that effort were directed at rebuilding the wealth of communities that was extracted as a result of the financial crisis? Can you imagine if we as a movement were focused not on debating minimum wages but instead asking what we are going to do as a society about those making maximum wages, the CEOs whose salaries are so out of whack in this country? What if we were all focused on offense, on fights that take head-on the growing gap between the richest in the country and the rest of us? What if we were debating how we bring more prosperity instead of how low we can go? Now that would be a movement. THIS IS WHY WE NEED INDEXING. So we do not have to keep fighting this battle every few years. And, for God’s sakes, so our most talented organizers and thousands of grassroots activists don’t have to move heaven and earth to accomplish small vision wins and can instead focus on the transformational victories working people in this country long for and desperately need. We Can Do This. We Will Do This. There are encouraging signs. We know the grassroots mobilization has had an impact. We hear it from legislative aides exhausted from taking calls and answering emails. We hear it from legislators themselves, some of whom are thrilled and some of whom are annoyed and say things like “you’re only hurting yourselves” (pro tip: a sign you’re winning). The legislature just passed and the governor signed a tax bill that, in addition to reducing taxes on many middle and working class folks, also happens to reduce the amount the very wealthy in our state pay in gift and estate taxes. The tax bill passed with a lot of urgency and fanfare. Let’s apply the same urgency to getting this done so we can focus on transformational work. I know we’re going to win this. The people who mobilized are going to win this. Let’s get this done and then harness that energy and move on to truly transformational work. This is an important issue happening in Minnesota and nationwide. Thank you to the activists working on behalf of minimum wage workers and lets get this done!